Autophagy is a physiological process conserved by evolution for the recycling of cell constituents, as organelles or fragments of cytoplasm. Autophagy does not cause loss of cell chemical components as the cell reutilizes them. The lysosomes are acidic vesicles delimited by a single membrane formed in the Golgi apparatus. They contain acid hydrolases for degradation of proteins; lipids, nucleic acids and glucids, and they fuse with diverse types of phagocytic vesicles. Autophagosomes contain undegraded cytoplasmic ground substance and recognizable organelles. The transformation of an autophagosome in an autolysosome occurs by the acquisition of lysosomal membrane proteins and the delivery of acid hydrolases. The autophagy mechanism is considered as a protective system; organisms in starving conditions, autophagy is a procedure to reduce metabolic demand by the cell and thus avoid death. On the other hand, autophagic cell death is a form of programmed cell death morphological and metabolic different from apoptosis. Autophagic cell death is accompanied by cytoplasmic vacuolization and activation of lysosomal enzymes. 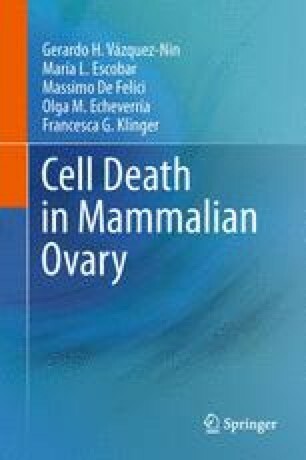 Due to the absence of a rupture of cell membrane and leak of cytoplasmic content, this cell death program is characterized by the lack of a tissue inflammatory response.